Life is Strange is Incredible! I know I don’t usually do videogame reviews, but it is something that I have looked at introducing to this blog before, so if you like the idea then please let me know! I have bumped into a game the other day, and I’ve never seen a videogame come so close to bridging the gap between videogame and film. It’s called Life is Strange, and it is completely captivating. I just had to share it with you! Developed by Dontnod Entertainment and published by Square Enix, Life is Strange is a decision making game split into five episodes, the 2nd one released on 24th March and the next scheduled for May. The story follows 18 year old Max Caulfield, a senior who moves back to her hometown to study photography. One day she is in the girls bathroom at her school when she sees her old best friend from her childhood, Chloe, a friend who she hasn’t spoke to in five years. She hides when she sees her threatened by an aggressive rich kid from the town. She is killed in front of her, which is when Max discovers she can travel back in time. Using this power she saves Chloe and embarks on a journey with her to uncover the strange disappearance of Chloe’s new best friend Rachel Amber, while at the same time going through the problems all 18 year olds go through when swapping home life for the dorms. It’s probably not the best plot description but I’ve only played the first episode, and as far as I know they’re not revealing completely what happens yet. It is available on basically everything, but I’ve played in on the PS4. Although it has to be called a decision based game – meaning the player has opportunities to choose Max’s options which impact on the story – I personally see it as more of an interactive movie. 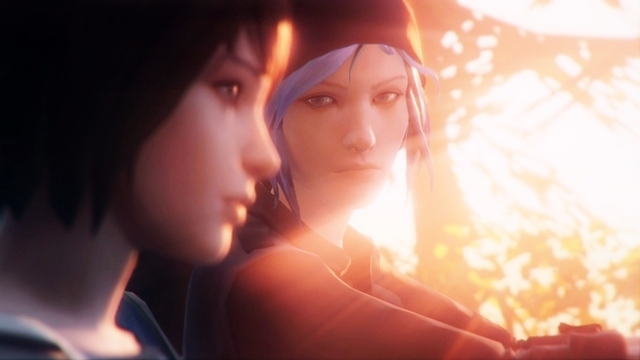 Unlike most videogames, Life is Strange spent the majority of their budget on writers and voice actors, showing how they felt the story was more important to them than the gameplay. That does come across, because while the movement and interaction is fairly basic compared to modern times, the story itself and the way it is portrayed is not far off movie standards. In fact, with a bit of tinkering this could be made into a movie one day, or at least some fan fiction? Max Caulfield and her friend Chloe from Life is Strange. The constant criticism thrown at videogames when they take on the movie industry is the graphics. When games try and look realistic they will always get put down, the technology just isn’t there for that right now. However, this game is completely drawn by hand, meaning that in terms of visuals this should be considered more as an anime piece than a realistic ‘film’. Do you think that videogames could one day eclipse the film industry, particularly led by games like this? I will probably write a piece about it in the future, so if you can give some of your opinions below that would help a lot! I am really glad to see a game like this because I grew up surrounded by videogames, and for me at a young age they were my movies – a chance to travel and explore a crazy world much more exciting than our own. I always thought that games were like movies (I’ve played a lot of games that had some of the greatest stories I’ve seen to this day), but with Life is Strange the industry has proven that they can cut it with the film industry – maybe not quite Hollywood, but still! I’m not saying this will appeal to non-gamers purely because of the story, because it is a videogame at the end of the day. If you have zero interest in games then it’s probably not for you, but if you like movies (I would hope you do, anyway) and have a general interest in gaming then you have to try this! As mentioned at the start, if game reviews is something that would appeal to you then please let me know! Oh yeah, we’re looking for reviewers to write articles for us. If you want to write game reviews for us then that would be AMAZING! Click here to find out more.